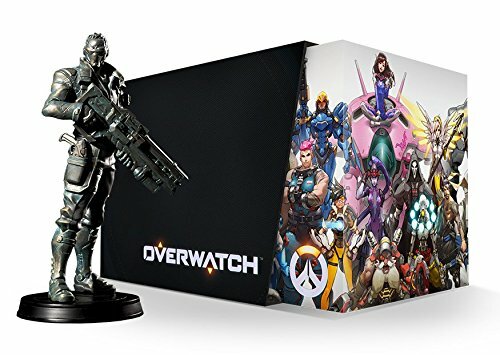 Overwatch - Collector's Edition and Pre-order bonuses — GamingWithSwag.com - Dads By Day, Gamers By Night. Now that The Division has been released many are looking forward to Overwatch so I thought we should highlight the special edition of the game which is still in stock, and they recently added Beta Access for those who pre-order the game. The collector’s edition only has a few items to differentiate it from the base game, but the highlight is the nearly 13 inch statue of Soldier: 76. Thankfully they chose a nice dignified pose that should look nice on any desk or shelf. You also get a visual sourcebook for those who love the artwork, and Blizzard games historically do have a devoted following in that regard. You also get a soundtrack, but for a game like this you will likely be hearing a lot of it anyway as you hustle to master the game. As for the digital bonuses, you get them all with the Origins edition or the Collector’s edition, although you have to pre-order one of them to get the Noire Skin for Windowmaker. The bonus items are a nice nod to the other properties under Blizzard’s umbrella. You can wear Mercy’s Wings from Diablo III, play with a pet Baby Winston from World of Warcraft, use the character Tracer from Heroes of the Storm, and get an exclusive Overwatch themed Card Back for Hearthstone. You also get classic in-game portraits from Starcraft II, and can enjoy vintage skins of some the Overwatch team. If you love everything Blizzard this is a delicious bonus. I think the character variety could lead to some interesting combat and create unexpected momentum swings during the rounds so I am really curious to see how this game turns out. Check out the trailer below to see if it strikes a chord with you.